Just because the holidays are over doesn't mean that 2 Chainz is finished helping families. In December the Atlanta rapper helped a disabled veteran pay her rent for a year through his charity, TRU Foundation. The money used was generated through his "Ugly Christmas Sweater" line. Now the rapper is helping another family in need. 2 Chainz came across a GoFundMe page created by Atlanta's Progression Church. The church was raising money for a family of 11 facing eviction from their home. That prompted the rapper to extend his help. 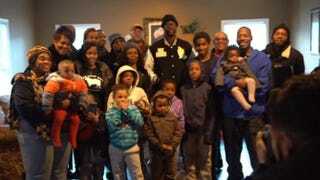 2 Chainz's organization gifted the family with a five-bedroom, twp-bath house free for a year. "All you have to do [is] pray … you got to have faith," 2 Chainz wrote on his Facebook. "You never know where your blessing will come from. Just keep praying and the man above will answer, ya digg?" 2 Chainz stated. Through his organization, the rapper is constantly proving that he's more than party music; he's also about giving back to his community.